Even though I’m now aÂ Tenerife southerner I still feel the pull sometimes for the west coast where I lived when I first moved to this land of sun, sea, Dorada and CD Tenerife. Puerto Santiago was where I first rented, a lovely Canarian enclave just above Los Gigantes, with some lovely bars and restaurants. Sitting on the terrace outside Bar Camber or Bar Central I could just see the top of Hotel Barcelo Santiago but you can seemuch more of it by winning a weeks holiday in the latest Tenerife Magazine competition. This 4 star hotel is perched on the craggy coast with views from the pool area across to the towering cliffs thsat give Los Gigantes its name. Packed with the best in accomodation, service and food it welcomes families, couples and singles all with the same warmth. Since I moved on the commercial area nearby has been given a complete facelift and a new coastal walkway has been added so everyone can enjoy the rock pools and great views out to La Gomera and of course to those famous cliffs. Recently I took a walk along the coastal path and was very impressed by what I saw, take a peep yourself. If you hurry you could still win a weeks half board holiday for two, and it’s dead easy to enter. 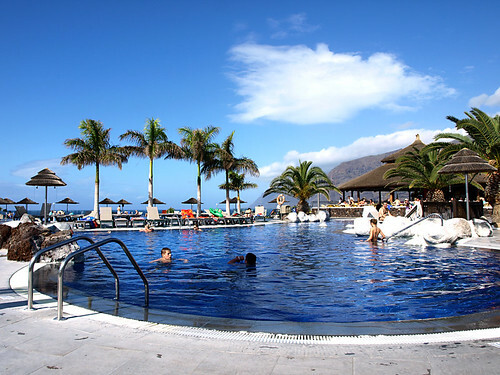 Just click like on our Tenerife Magazine Facebook page to join the other fans in the draw on Monday 31 January 2011. If you are the lucky winner you have 7 days after we contact you on Facebook to confirm you will be taking the prize, then you and a guest can enjoy a weeks half board stay at Hotel Barcelo Santiago anytime in the next year subject to availability. The prize does not include transport, is not transferable and there is no cash alternative. If the lucky winner does not claim the prize within 7 days it will be drawn again. If you find yourself up on the west coast pop in and have a look around, the staff will make you very welcome – but if you stroll around a few of the local bars don’t mention my name, I think I settled all my bar bills but you can’t be too careful.